This Years Valentines Window, sorry it’s a late post but we have just launched our new website and the change over of the blog to the new site caused a delay. The inspiration to this Window was ‘school love’ the gorgeous logs were cut and carved by Branched Out in kelfield our local tree fella! Which really set the scene and the red satchels planted with ivy. Think we are all enjoying this early spring and with the arrival of our new silk flowers this week we are ready for spring. These are a few of our pictures from the weekend, we got to meet some lovely brides to be and there families. This year we celebrate Halloween with cute tin night light pumpkin friends and soft Jellycat fox and squirrels, gorgeous scented candles. Of course we have the return of the Pendle witches.. spooky time. This years Spring wedding fair at Carlton Towers was full of glamour by its exquisite surroundings a perfect setting for a bang on trend wedding. Now Carlton Towers has been the back drop for our very own favourite Series Victoria, the venue couldn’t be far from a fairytale story. This spring here at Lisas florist, we have included soft peaches and rose gold into the designs to give that vintage glamorous look.. here are a few pics from the day. The Beautiful Selby Abbey was the perfect venue for a summer Sunday wedding. We have dressing the aisle with an abundance of summer shades and scooped garlands down though the choir stalls. This Carries your eye right down the aisle and is finished off with two pedestal flower arrangement, which gives a lovely impacted. This pedestal are an made from a selection of summer flowers, including Anthuriums, hydrangeas, gerbera, lily, and roses. David Heath was well know in the 2006 Xfactor contest as part of Eton Road, with fellow singers Anthony Hannah, Danny Morris and James Edwards. That year the winner, Leona Lewis took to the world by storm but there is no love lost between the contestants and remain friends. After the show finished David opened a fantastic dance school for kids ‘Attitude Dance’ which is based in Liverpool where the star still lives. Each year he performs in pantomimes around the country, and got to see him when he came in the opera house in York a few years ago. I got to meet David though another friend and I was lucky enough to be able to get an interview with this charming guy. ‘What’s Simon really like?’ I smile with a cheeky grin! With two main wedding fair locations (Monk Fryston Hall & Carlton Towers) in spring and autumn, we pride ourselves at Lisa’s Florist on the attention to detail. Making the day special for you and working with you so we can achieve some great designs. Pick and book venue, this can be a long process but an important one as this sets the scene for the whole wedding theme. Venues can be well booked in advance too, so this must be your first destination. Your wedding breakfast is the first meal in wedding bliss…. Arrange along side your venue booking the place you would like to take your wedding vows. Whether it be in a church, religious spot or somewhere simple. Even in a unusual place there is so much scope now. Choose wedding themes and colours, picking things that you like and sticking to it can be quite hard. There is so much choice out there and it’s important to keep focused on the things that are important than the things that may look to busy and confusing in the end. The dress and the beautiful bride, this is the part that separate us from the beast! Every girl just wants to feel special on there big day, so it’s so important that you feel right in ‘The Dress’ comfy and not to restricted but elegant and radiant. Follow this with Bridesmaid dresses to compliment and not to out stage the bride. Make an appointment to see your florist, at Lisa’s Florist Selby we take appointments all year to discuss your floral needs. At these times it’s good to see and hear what stage of your wedding plan is at and talk about all expect of floral arrangements you need. This makes the icing on the cake and is important to not be missed when budgeting. Icing! Yes the cake, buns or last year and more this year of the usual ‘Cheese Wedding Cake’ (not iced) but floral decorated by us. Book cars or buses etc. for travelling to venue or bring you home after. Place order for invites and any other wedding stationary. Sort the boys…tux, bow or tie something he’ll wear with pride. Thank you gifts, floral hand-tied, orchid plant or something more personal. 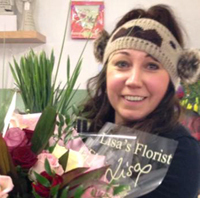 Lisa Walsh is the longest serving florist in Selby and has been in the flower industry for over 25 years. Lisas Florist - Selby © 2016 - All Rights Reserved.